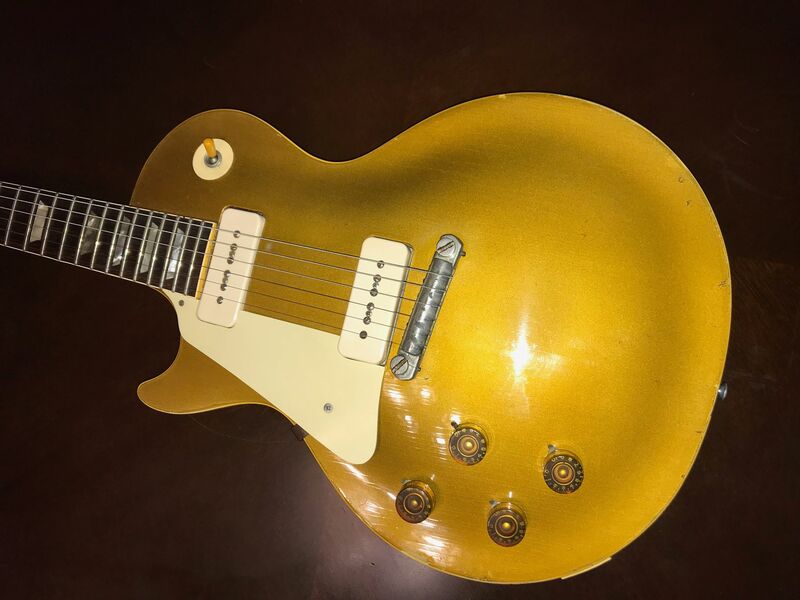 1954 Gibson Les Paul Goldtop, All Gold, EXC Condition with OHSC! 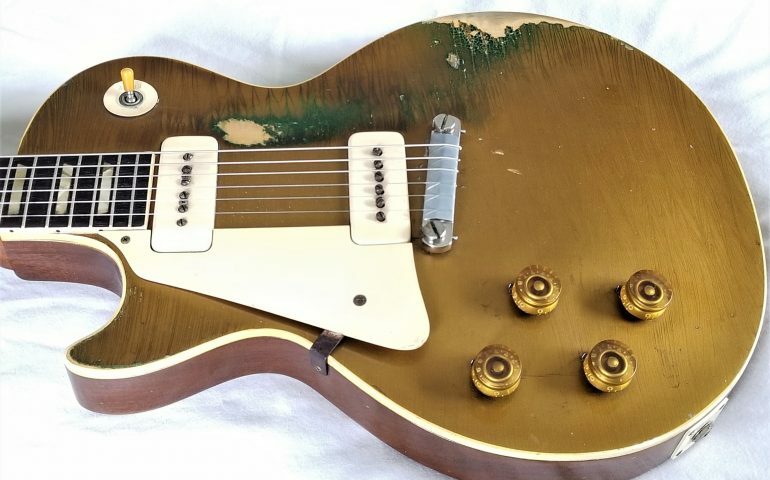 This is a factory Left Handed 1954 Gibson Les Paul Goldtop, 100% original except for pro-refret and 2 replaced pots, OHSC, EXC condition. 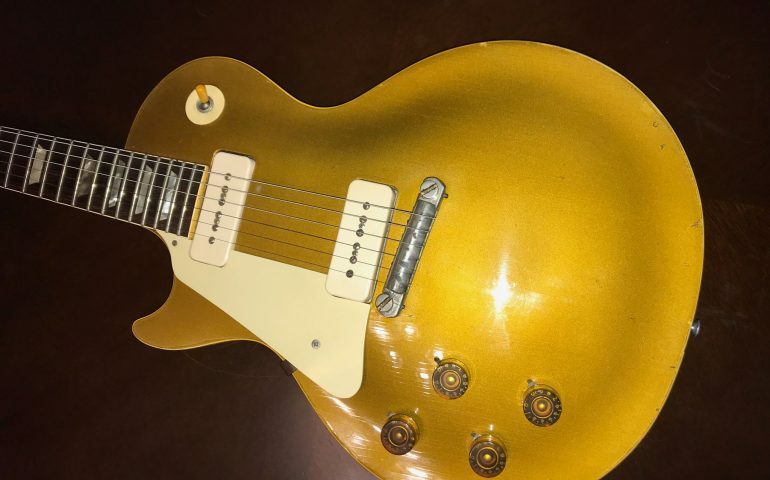 This is also a rare All-Gold Gold Top, including the neck. There’s nothing that sounds like a 1950s P-90 Goldtop! 2011 Gibson ’67 Flying V, Historic/Custom Shop, Near Mint with COA/OHSC! 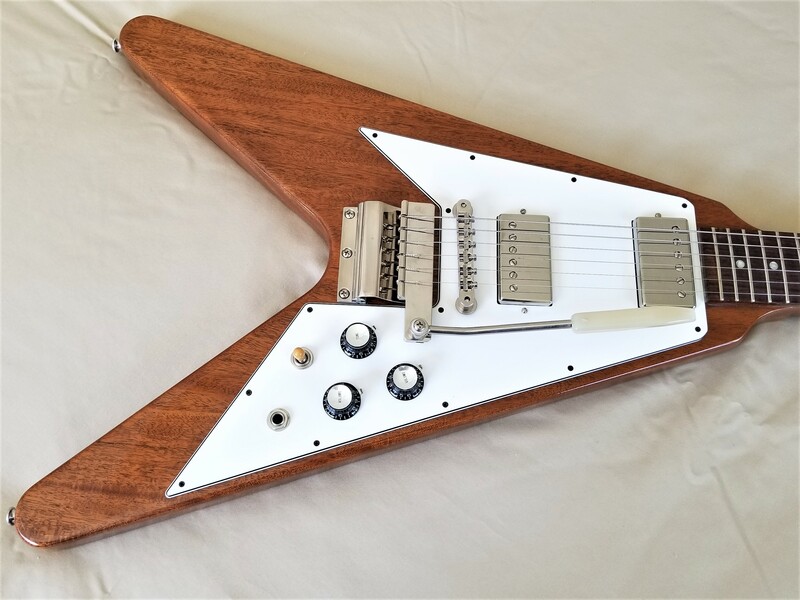 This is a 2011 Gibson ’67 Flying V, short Maestro Vibrola, Historic/Custom Shop model, Antique Natural finish, Mahogany body/neck, rosewood fingerboard, chrome hardware, Gibson Deluxe (Kluson-style) tuners, reflector cap knobs, pickups are BB#2/neck and BB#3/bridge. Has a nice medium Neck profile – .85/1st fret, .99/12th fret. The V has a nice light weight at around 7 lbs. This guitar is unplayed and in Near Mint condition, with just a handful of tiny dings on the back, some very light aging on the chrome tailpiece. Has one added strap knob on the bottom horn. It looks like a new guitar – this is the last Gibson guitar from a collection of unplayed modern era high-end Gibsons. 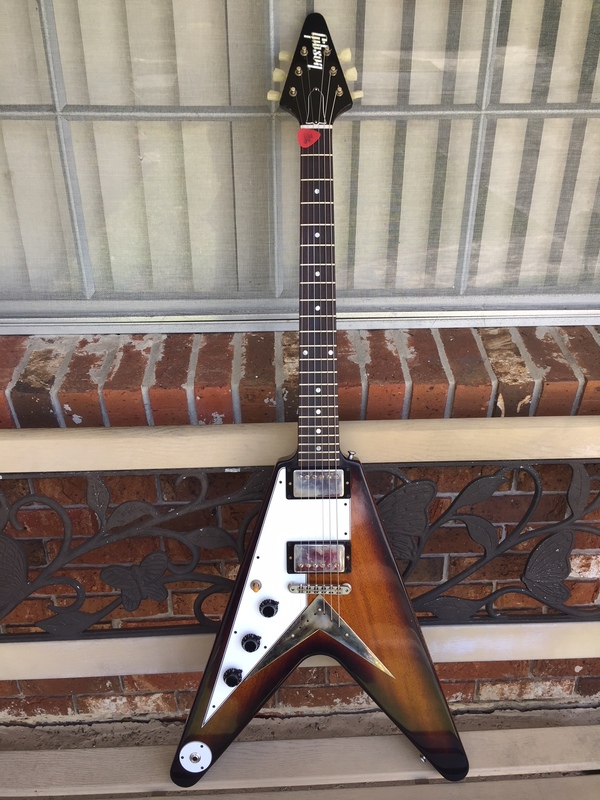 The V was purchased in 2011 from Max Guitars in The Netherlands. 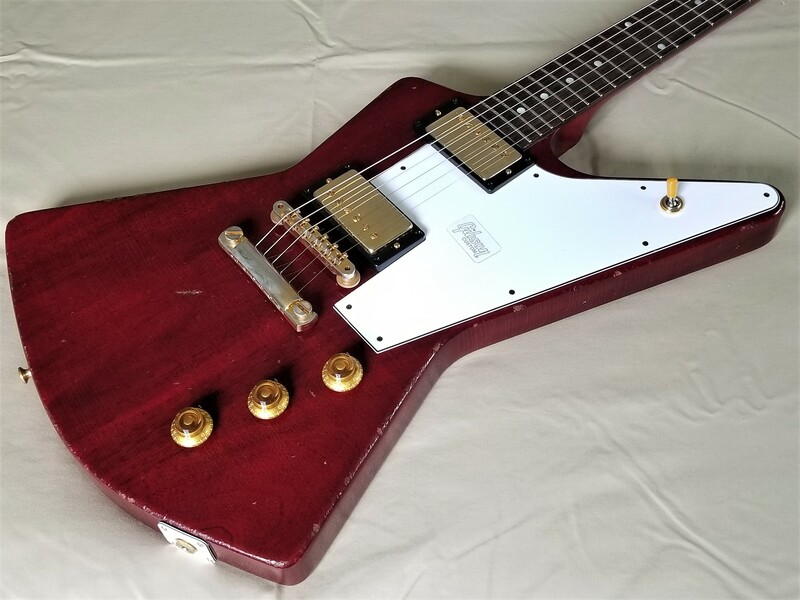 2018 Gibson Custom Shop 1958 Explorer, Clapton Cut, Cherry, Heavy Aged, New with COA/OHSC! 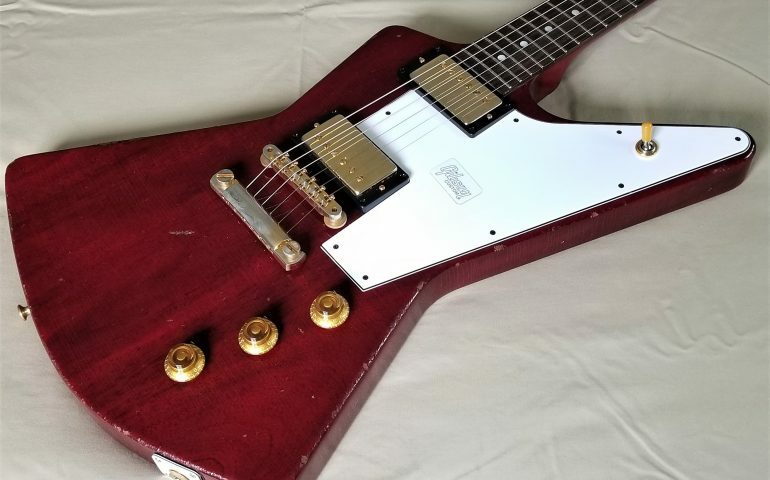 This is one of the coolest guitars to come out of the Gibson Custom Shop: 2018 Gibson Custom Shop Explorer, Extra/Elbow Cut, with a heavy aged One-Piece Mahogany Body, Faded Cherry Finish, Gold plated Nickel hardware. 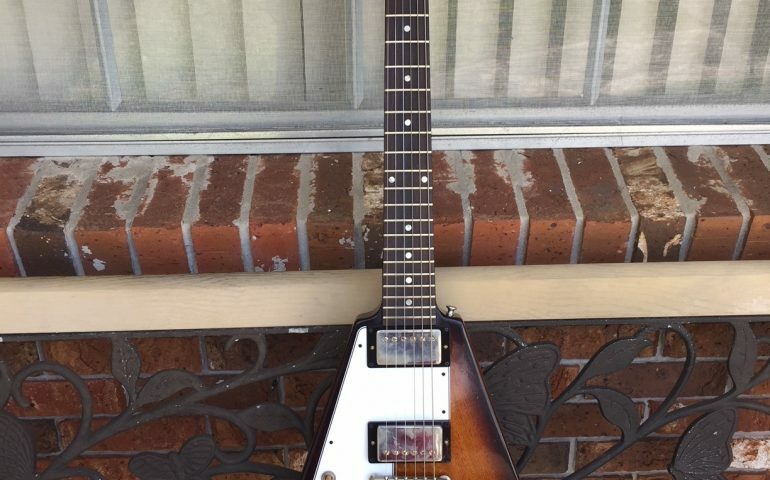 This model is patterned after the 1958 Explorer owned by Eric Clapton. It is brand new with OHSC, COA, and all paperwork/tags. The weight is light at only 7 lbs, 12 oz. This is only one of a limited run of 5 in the Faded Cherry. 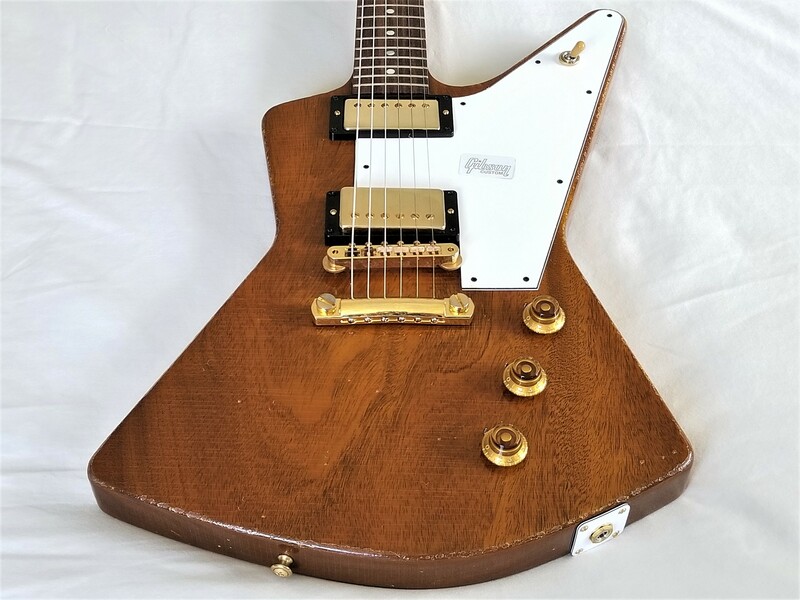 2018 Gibson Custom Shop 1958 Explorer, Clapton Cut, Natural, Heavy Aged, New with COA/OHSC! 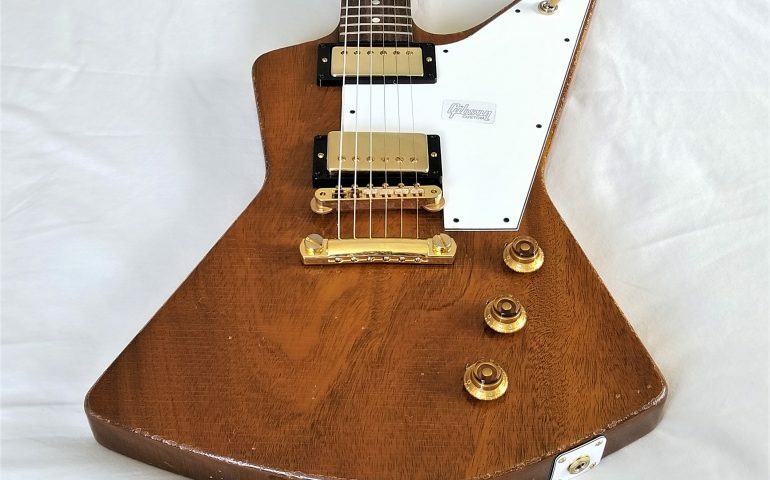 This is a right handed 2018 Gibson Custom Shop Explorer, Extra/Elbow Cut, with a heavy aged One-Piece Mahogany Body, Natural Finish, Gold plated Nickel hardware. 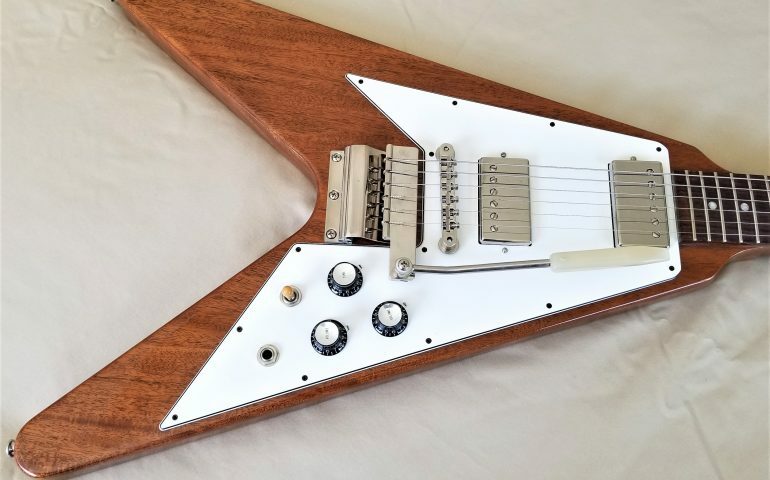 This model is patterned after the 1958 Explorer owned by Eric Clapton. It is brand new with OHSC, COA, and all paperwork/tags. The weight is light at only 7 lbs, 12 oz. This is only one of a limited run of 5 in the Natural Finish. I also have the same guitar in Cherry finish, one of only 5 in the Cherry finish. 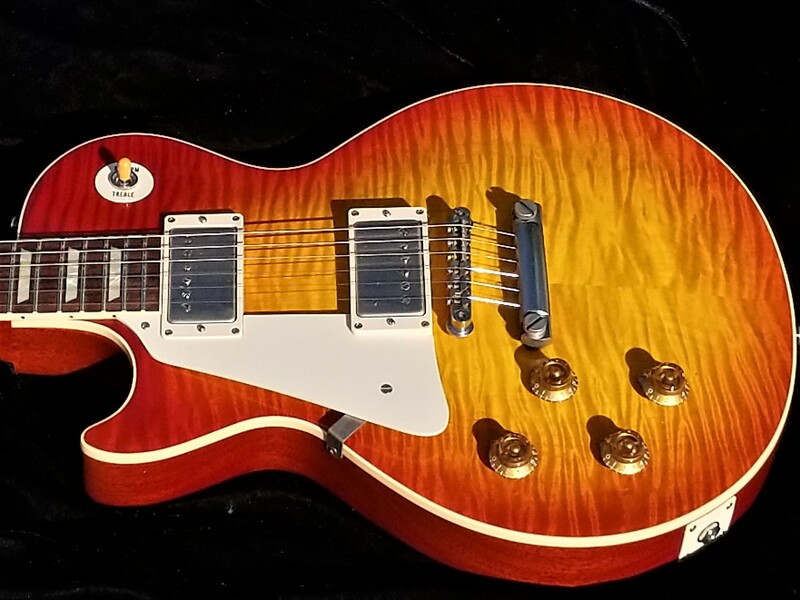 2014 Gibson Historic 1959/R9 Les Paul, Cherry Sunburst VOS, , Near Mint! 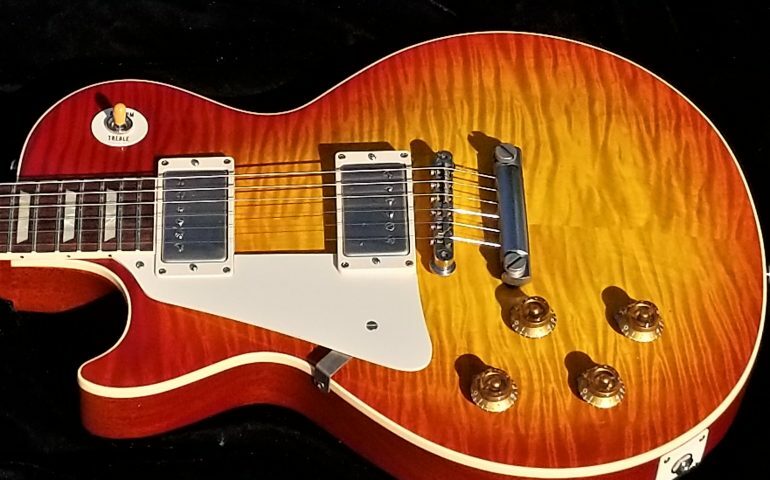 This is a 2014 Gibson Historic 1959/R9 Les Paul, Cherry Sunburst VOS with a Beautiful Figured Top. Includes all tags, paperwork, and OHSC. 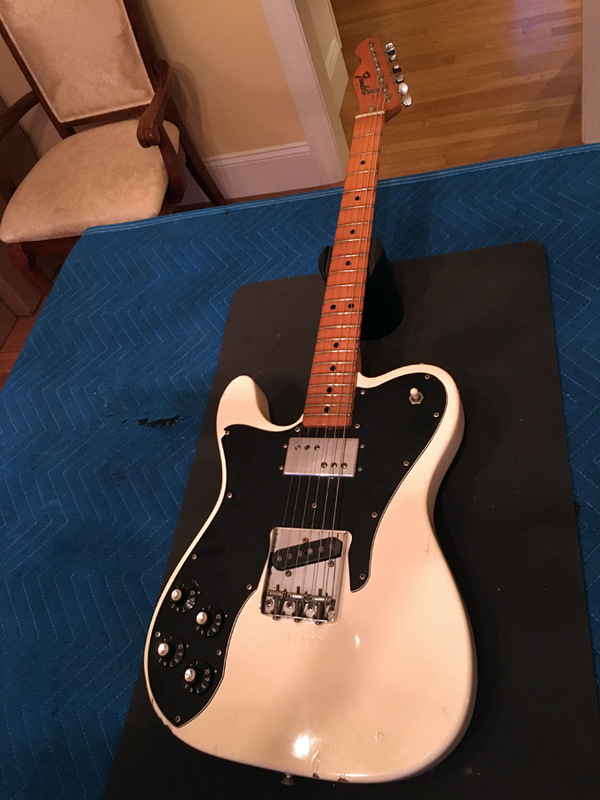 Even though this guitar is pre-owned, it’s as close to a new guitar as you will find. 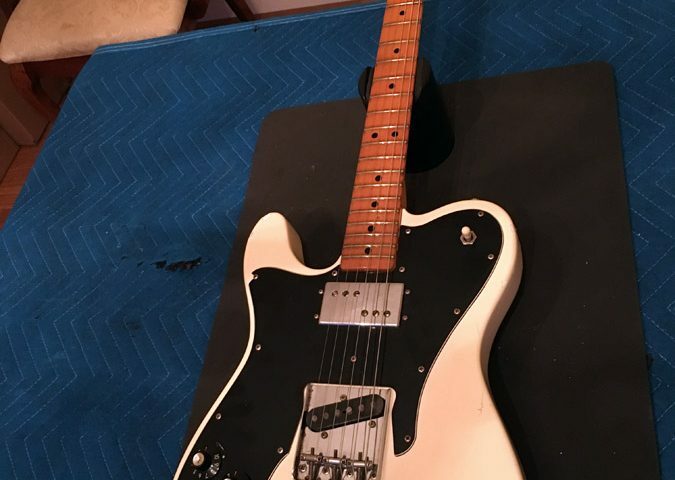 It has 3 tiny dings on the back only – otherwise this guitar looks, feels, and plays like new. I like a lot of Red in a Les Paul Sunburst, and this one’s got it. Cherry Sunburst is my favorite color in a Les Paul. And the flametop is gorgeous on this one! 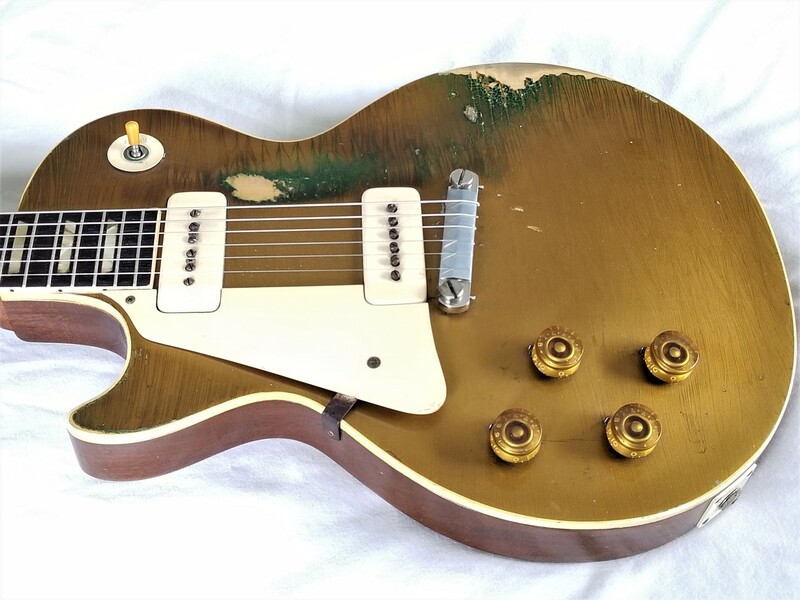 1953 Gibson Les Paul Goldtop with OHSC and Gruhn Appraisal! “I have personally examined the instrument described below. We certify the instrument described below is, in our opinion, a Gibson Les Paul Model left-handed electric guitar, made after mid-year 1953. 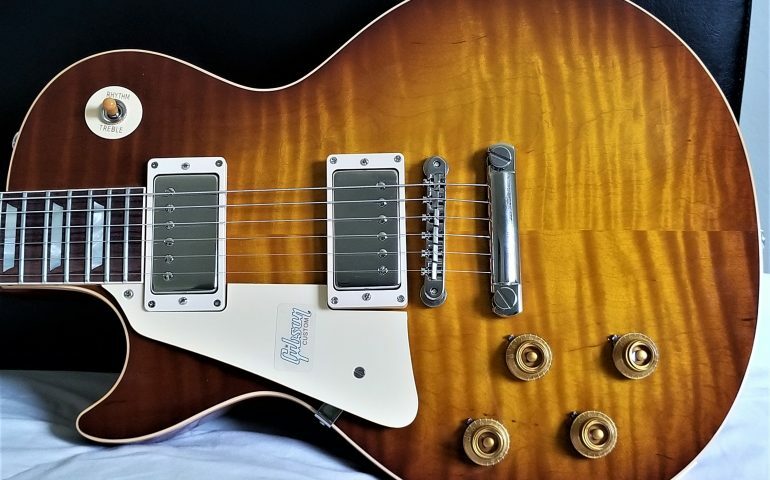 2018 Gibson Custom Shop ‘59 Flying V, Tobacco Sunburst, Aged, Mint with OHSC/COA! This is a 2018 Gibson Flying V, Custom Shop ’59 re-issue, in Tobacco Sunburst with aged finish. Mahogany body with Burst Bucker humbucker pickups, aged Nickel hardware, Rosewood fingerboard. Light weight at 6 lbs, 6oz. This is the only lefty Custom Shop ’59 V I have seen! 2018 Gibson Historic 1959/R9 Les Paul, New with COA/OHSC, Magnificent Top! 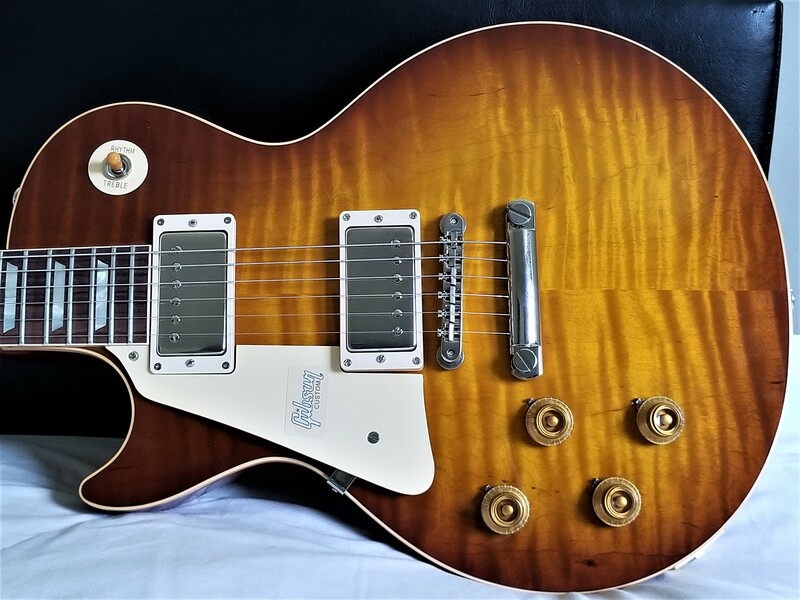 This is a Brand New 2018 Left Handed R9 Les Paul, Royal Tea Burst, Gloss Finish, Nickel Hardware, Perfect Les Paul weight at 8.5 lbs. If you’re in the market for an R9, it’s all about the top. This one has a stunning top, looks great from any angle or light – one of the best Les Paul tops I’ve ever had! And it plays and sounds as good as it looks – R9s don’t get any better than this!